Oliver Herbert (cello), as the 2013 winner of our Young Artist Competition at age 15, amazed us with his performance of Schelomo by Ernest Bloch—his solo concerto debut. We enjoyed him so much he returned in 2014 by popular demand to play Tchaikovsky’s Variations on a Rococo Theme, giving us two wonderful opportunities to hear a phenomenal young cellist at the beginning of his solo career. 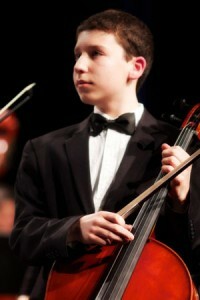 Oliver became principal cellist of the San Francisco Symphony Youth Orchestra in 2012. Other solo engagements include collaborations with the Ocean City Pops Orchestra, the Nova Vista Symphony, and as a featured recitalist at Dixon Stein in Chicago. He has won first prizes in our Felix Khuner Young Artist Competition, San Francisco Symphony Youth Orchestra Concerto Competition, Philadelphia International Music Festival Concerto Competition, Nova Vista Symphony Concerto Competition, Colburn Academy Concerto Competition, and the Spotlight Competition. He was also a 2015 National YoungArts Foundation finalist and a 2015 US Presidential Scholar in the Arts nominee.